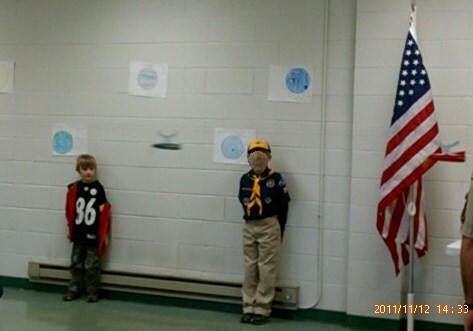 Last week the Boy Scouts held their annual Space Derby. Each boy was given a kit to build their space ship. The husband glued the two blocks of wood together. Once they dried, he began to sand out the square into the shape of a rocket. The husband did the bulk o the sanding, but Little Dude definitely had a hand in it. Once the husband deemed the shape of the space ship acceptable, it was handed over to me. My job was to then apply a base coat of paint. Sky blue was the color Little Dude picked. Once that was dry, Little Dude took over with a handful of brushes and a full palette of paint. Last Friday, the husband added the propeller and the fins. Saturday afternoon we were off to the race. We were all worried as this was Little Dude's first time with this race. It was the husband's first time since this was an event his Boy Scout troop opted out of. By the end of the race, Little Dude's space ship had won 6 races before it was eliminated. 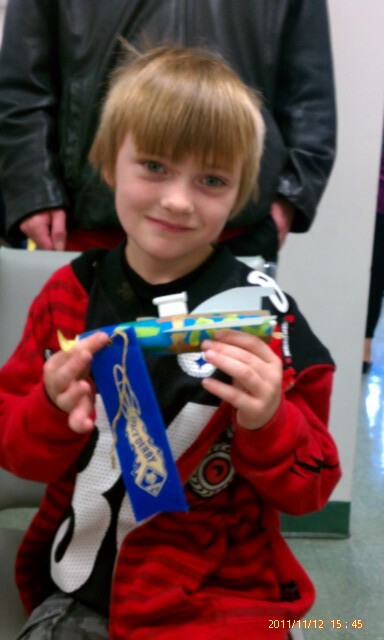 Had he won just one more race, my boy would have placed third and that would have given him a trophy. The husband and I were a little disappointed that, for the second Boy Scout race, Little Dude was just one race shy of a trophy. But I don't think Little Dude cared. The race by itself was enough for him. But a blue ribbon didn't hurt either! Very cool!! How did they race the rockets?